Twenty five years ago, I bought a hitch system called Convert-A-Ball. One shank and three hitch balls. The balls were pinned to the shaft and to change balls, all you needed was a small punch. A small screwdriver, even a key would work. I had three balls that fit that shaft, a 1 7/8, a 2", and a 2 5/16. I kept the spare balls in the same bag that I keep my jack and jumper cables in the truck. Yesterday I needed to move a trailer, and I seem to have misplaced my 1 7/8 ball. Just Damn! I've had that system for 25 years and suddenly one of the hitch balls goes missing. Aggravating. I spent the morning running around looking for a ball. No joy, no cigar. I guess I'll order it online. However, I was at Academy Sports and they had .22 LR ammo in stock. That's the first time I've seen .22LR on the shelves in about eight months. Limit was two boxes, and I got both of mine. Maybe the shortage is starting to diminish. I can only hope so. Couple of months ago, I acquired a bag of range pickup brass. I knew that overwhelming majority of it was .45 ACP. Today I dropped that bag of brass into the tumbler to clean it before sorting it. Bad idea. It seems that when you're tumbling brass, a piece of .40SW will wedge itself into a piece of .45 ACP during the tumbling process to the point where it takes pliers to extract it. 9mm brass is bad enough, but .40 SW brass seems to like to try to hide in .45 ACP, like it's ashamed to be seen in company with the larger brass. Aggravating is what it is. That'll teach me to take a shortcut sorting brass. It seems that Bill and Hill are angry at comparisons between themselves and mayoral hopeful mayoral hopeful Anthony Weiner and wife Huma. Why would they be angry? Bill Clinton set the most recent standard for sexual sleaze for a President, and Hillary lost her feminists creds when she decided to stay. It's easier to stay with Bill, ride his coattails (or his fly) and move in political circles so that she could become a senator, a presidential candidate, and what was arguably the most horrific Secretary of State in modern history (can you say Benghazi). If Hill had any self-respect at all, she would have left immediately after Monica wiped her chin. She didn't and now she and her philandering husband have set the standard for sleaze. All the Weiner's are doing is following that example, and calling attention to it. Why should the Dems shun the Weiner's when they continue to bow at the altar of Bill and Hill? It's a valid question, and a valid comparison. From what little I know about Huma, she was Hill's aide for many, many years, learning at the feet of the master. Anthony and Huma are following the Clinton model. Bill and Hill should be proud. Emulation is the best compliment. I spent the morning at the casting bench, turning scrap lead into useful bullets. I cast for several hours and when I had finished, and everything had cooled, I sorted bullets. From this morning's labor I have 370 good, useable cast bullets that I didn't own at daylight. That's Lee's TL452-230-2R. It's a standard 230 grain round-nose bullet for the .45 ACP, very good plinking and target bullet. 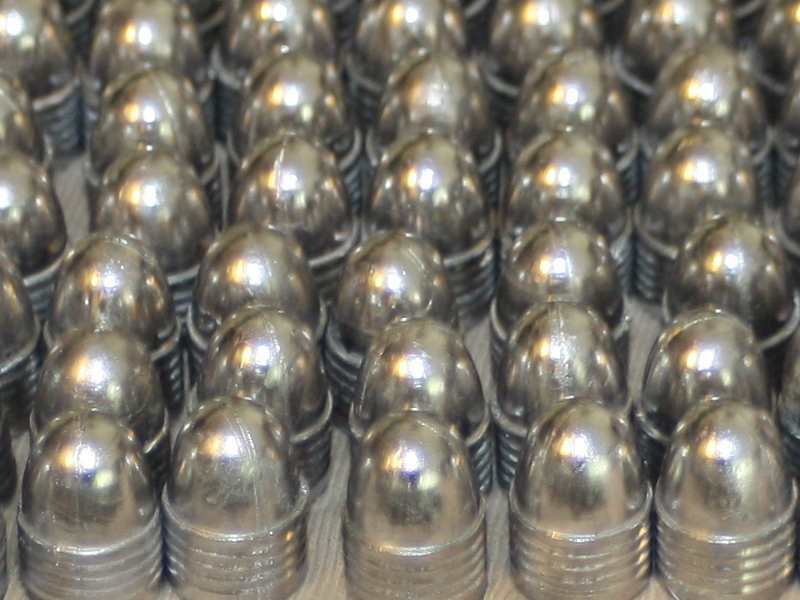 With about 4.5 grains of Bullseye, it mimics the standard hardball load so beloved by .45 auto shooters. This afternoon I'll tumble them in liquid alox and spread them on waxed paper to dry. Then, later this week, start cranking the handle on the turret press. I'll need ammo for the shoot on August 17th and those bullets play a prominent place in my plans for that Saturday. I awoke this Sunday morning to blissful sloth, too late to go to church. My apologies to the congregation, but I'm sure that they carried on bravely without me. Sitting the quiet house, surfing the internet, I began thinking about 1911 magazines. Two months ago I was running my 1911 on the USPSA course and had some magazine related issues. One mag in particular would not hold the top cartridge in the magazine. During a hectic stage, I slammed the mag home and was surprised to see the top cartridge pop out of the magazine, arc through the ejection port and fall to the ground. No one saw that but me and the timer, and that mag got lost among the other mags in the bag. So, I dragged out my 1911 and all the magazines for it, and started playing with the slide lock. Out of my sack of magazines, I identified two that would not engage the slide lock. I figured that weak springs were the problem, so I took those out to my bench. A year or so ago I had obtained some Wilson Combat magazine springs with follower. I took apart the two offending magazines and installed the new springs and follower, then tried them in the Colt. They both held the slide lock nicely. Then I loaded the magazines. One loaded fine. The other wouldn't hold any more than three rounds without pushing the top rounds through the feed lips. A quick inspection of the feed lips revealed that they were hopelessly worn. I disassembled that magazine, looking for a maker's mark. When I took off the bumper pad, I saw holes I had drilled in the base plate to install that pad and the remnants of a Federal Stock Number. I remembered that magazine as one I had picked up 15 years ago in an Ebay lot, of standard GI magazines. I myself drilled the holes in the base plate to install the bumper pad. I put that magazine body in the vise, crushed it, and dropped it in the trash. Changing springs in a magazine is a good idea, and that Wilson Combat kit I linked above is a good one to have. An additional benefit is because of the way the follower is made, it allows a standard 7-round magazine to hold 8 rounds. New springs are cheap, compared to new magazines, and anyone with a basic understanding of simple tools can change a spring. 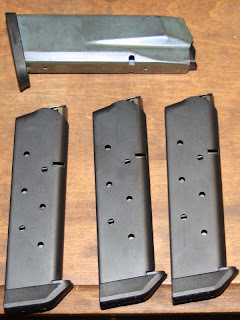 Now, all my remaining magazines work properly, hold the rounds securely and will engage the slide lock properly. If you start having problems with your semi-auto pistol, look first to the magazine. That's probably where the problem lies. 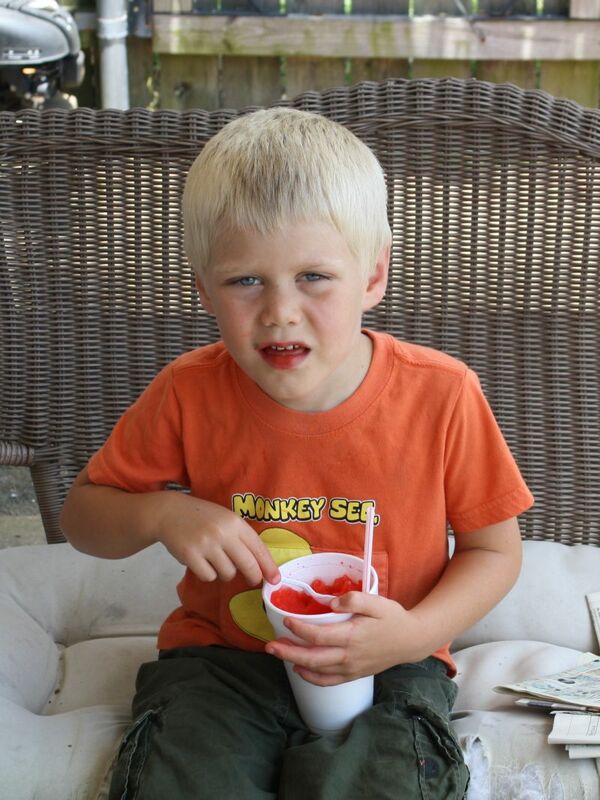 Every Friday afternoon, about 3:00, grandson and I head to the snowcone stand for a cool, tasty treat. We decided on cherry today. Milady happed to be taking a break from prepping, and I asked her if she wanted one. She opted for watermelon. Of course, the dog was curious to know what we were eating, so she got out a bowl and offered him a taste. 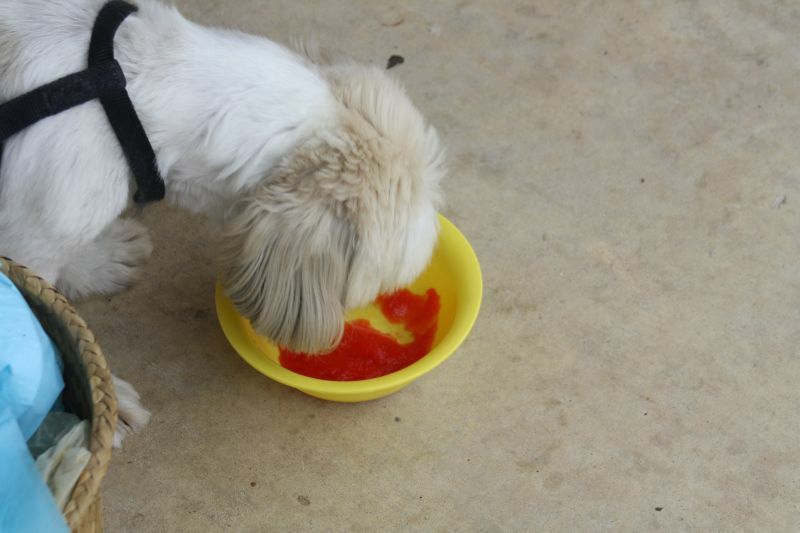 He likes watermelon snowcone just fine. I've been playing silly pistol games with the Cenla Sport Shooters. These guys sit around at night dreaming fevered dreams of stages that require multiple magazines-full of ammo. Most gunfights are over in three seconds and require less than three rounds, but if these fellows want multiple engagements they're free to design and build those stages. Nice guys, one and all. I'm not complaining, but I realize that what they're doing is not a serious representation of self-defense skills. So, realizing that my standard load of a hot pistol and two reloads was insufficient to play their silly games, I hollered up Brownell's and made an order. The one on top is for my M&P45 if I decide to shoot that, the three on the bottom are standard, 7-rounnd 1911 mags if I decide to carry the single stack. Those 1911 mags are carrying the Brownell's name. 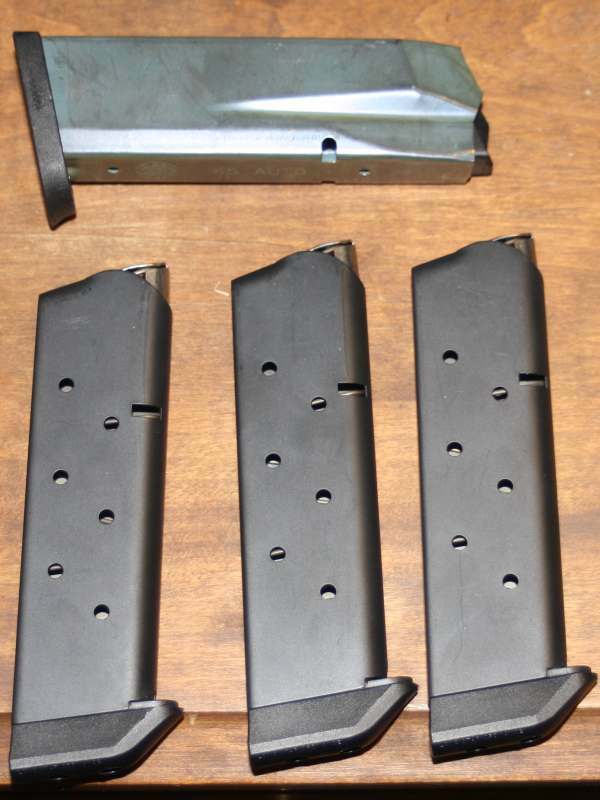 They're less expensive than McCormick's or Wilson's and from my initial inspection they seem to be very sturdy magazines. Adding those magazines to my current stash should give me enough spares to engage the zombie horde that the Sport Shooters seem to prefer. At least now I won't run out of ammo during a stage. It's fun shooting with those folks, it really is. This morning we cleared the patio of furniture, added cleaner, scrubbed it with a big push broom and hosed it down. Let it dry and put the furniture back on the patio. As the day gets warmer, we'll move inside for final straightening and give the kitchen a final mopping before I start the meat later tonite. Rivrdog wonders if my mother in law is a teetotaler? Not likely. She has one cocktail, maybe two, each and every day. Purely to assist the digestion. Her comestibles of choice are 1) Canadian whiskey, and if Canadian isn't available, (believe it or not) 2) straight gin, with three cubes and a splash of water. She believes that if you're going to build a fire, it makes no sense to put it out. Yeah, Rivrdog, there will be various potables. Which reminds me, I need to put the soft drinks in the outdoor fridge. And scrub down a couple of ice chests..
Saturday, we celebrate the birthday of Milady's mother. The matriarch turned 92 this week and we're all gathering at our house this year for the celebration. A joyous event, but because we're hosting, the house must be spotless, immaculate, well ordered. God Forbid that our kinfolks come over and find a spot of dust. We've been cleaning. Deep cleaning. Taking-the-curtains-down cleaning. And re-arranging. And the phone has been ringing what-can-we-bring. Tuesday was yardwork, Wednesday was cabinet cleaning, getting down everything and dusting. Cleaning windows, and taking all the blinds down, taking them outside and hosing them off. This morning I rented a Rug Doctor, moved furniture and deep cleaned carpets. Friday will be final prepping, setting up awnings, and making sure that the patio and decks are arranged. Late tomorrow night, I'll put the meat on to cook. Saturday we celebrate. So, what's on the menu? I'm going to cook some Italian Beef, and I"m going to make a Pulled Pork, at the specific request of the birthday girl. Milady is (as I type this) preparing Meat Pies to freeze. She'll have about four dozen done by the time I begin heating the oil. Meat pies freeze very well and they fry nicely in the frozen state. I'll fry those on Saturday morning just before noon. Others are bringing beans, and dirty rice, salads and slaws. And bread. I expect about forty people, and I'm sure that there will be plenty for everyone to sample. Which reminds me, we need to order the birthday cake this afternoon. In the aftermath of the Zimmerman trial, we're hearing a lot about Stand Your Ground laws. The common understanding is that under Stand Your Ground, a person has no duty to retreat in the face of violence. That person can meet force with force. The law didn't apply to Zimmerman, who was on his back being beaten when he fired the shot. He had no where to retreat. His back was literally to the ground. Still, the left wants something done, and Stand Your Ground seems to them to be a place to start. Under their scenario as I understand it, if I'm in a place where I have a legal right to be and I am faced with violence, I should first try to retreat from that violence before resorting to force. That's all well and good, but I shouldn't be forced to retreat as a matter of law. Retreat should be one trick in my bag of options, but not one that the law prescribes. If retreat is prescribed then the question becomes; how far should I retreat to meet the legal standard? One step? Two steps? What is the requirement? Or, why should I, a law-abiding citizen, be forced to retreat at all? It opens another can of worms that should never have been opened. Self defense is a natural right, one that applies to the animals in the wild as surely as it applies to humans in whatever predicament we might find ourselves. I have the same right to protect myself as the animals on the veld. No legislator can legislate it away, it is a natural right. You'd sooner tell the zebra that he can't stomp the lion. Did the zebra retreat? I don't know and I don't care. 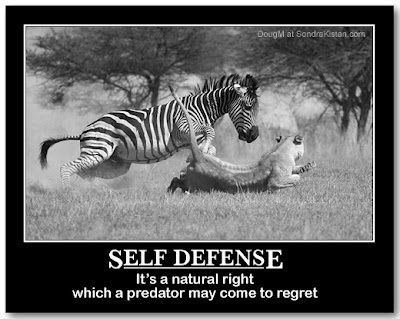 What I care about is that the zebra chose to defend himself. That's all that's necessary in natural law. This is the Most Disturbing Newspaper Cartoon You'll See All Day. That's the headline over at the Policymic. Okay, just for the sake of argument, let's look at the cartoon. That is disturbing. A stout tree, marked Sharpton with four corpses lynched. It is a disturbing image, and Policymic opines. 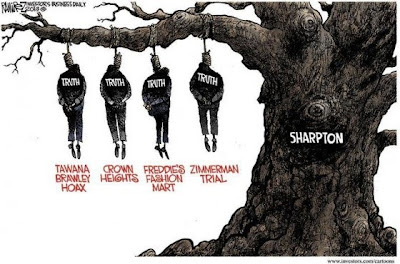 The two newspapers can comment all they want about Al Sharpton's actions but to utilize the horrific image of lynching as their metaphor is simply wrong. When such ghastly acts have marred our history, it is senseless to display an image that has represented the epitome of racism in America. I also think that the image is horrific, and it becomes a metaphor for Al Sharpton, who has shown a propensity to ignore the facts and inflame racial tension. In each of the four incidents depicted above, the Rev Sharpton got involved, to the detriment of the situation while simultaneously enriching himself. I saw the very same operation during the Jena Six incident. Sharpton involved himself in that incident as well, to the detriment of everyone involved. I agree that the image is disturbing, but is illustrative of Al Sharpton, who in my opinion is the current epitome of racism in America. Al is not worried about the truth. All Al is worried about is Al Sharpton. The fact that he imflames racial tensions for his own notoriety makes him a racist of the most despicable sort. I'm no fan of Pampas Grass, but I understand that it has a purpose. Generally, to attract snakes and wasps, but also to hide unsightly areas that you can't improve. If you can't improve it, hide it, and pampas grass is just the ticket in these climes. Still, I'm not a fan. I have this little patch in the front yard. I'm not crazy about it, but it hides a sewerage lift station, a very important piece of infrastructure in a suburban environment. We want to get rid of the sewerage, but we don't necessarily want a lift station in our front yard. If we have a lift station, we want to hide it. When we moved into the house in 2003, the previous owners had it all over the boundary. I've eradicated it everywhere but around the lift station, because it hides the machinery. However, it sits on a corner, and as it grew, it got bigger. 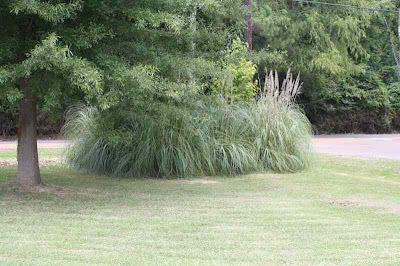 Family and neighbors were complaining that they were having trouble seeing around the pampas grass to look for oncoming traffic. I understood their concerns, and this morning I resolved to address those concerns. I began with hedge clippers. The grass laughed at my hedge clippers, so I stepped up to a machete, a nice, two-handed blade that I use for clearing brush on the deer lease. The grass shrugged at the machete. I could see that I was fighting a losing battle, and I don't intend to lose a battle to an invasive species, so I put away the machete and resorted to the tool that rednecks keep in reserve. The chainsaw. It ain't pretty, but any motorist can see around that corner now. I didn't go all the way to the dirt, but I'll assure you that the pampas grass knows I've been there. The next time I put RoundUp in the spayer, I'll have to remember to walk out there and add insult to injury. I had to hook the Mule to a trailer to haul off the debris. There was a lot of vegetable matter on the ground and it filled the trailer to overflowing. But, now the yard is mowed and the pampas grass is trimmed. If you'll excuse me, I believe I need a shower. It seems that as a private citizen, George Zimmerman has been keeping a low profile since his acquittal in the trumped-up murder trial. That's his right and his privilege and I don't much blame him for getting on with his life. However, he did make the paper recently, for helping a family get out of an overturned vehicle. Good for him, and good for ABC for covering it. The news story doesn't tell us the race of the family in distress, but it really doesn't matter, does it? I'm always telling Beau that he'll do till a good dog comes along, and I finally have a picture of a good dog. Sent to me by my friend Jenny. 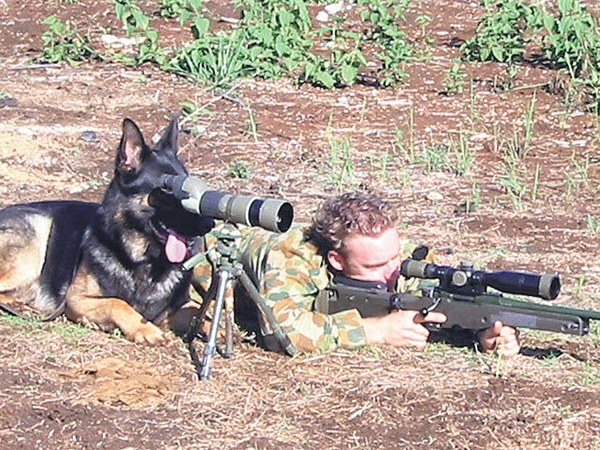 Acting as a spotter for his shooter. That's a good dog. 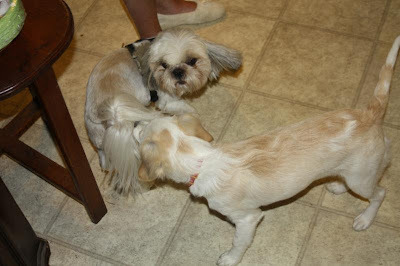 I tell Beau, that's what playing with girls will get you; constant aggravation. This morning I shot with the Cenla Sports Shooters, a USPSA club in the local area. Thirty of us gathered for a club match. I'm no competitive shooter, but when I get the opportunity to hang out with like-minded people, burn a little powder, and test my skills, it's a good thing. I have no delusions that I'll ever be a top pistol shot. My nearly 60 year old body simply won't allow it. But, it's great fun to watch the other pistoleros, to help the club, to give them a little cash for their coffers, and to help when it's time to break down the targets at the end of the day. There were a couple of young'uns shooting with us today. On my squad, a young man, 10-ish years old was shooting a Kimber 1911 in .45 ACP. I watched him on the courses and remarked to another squaddie that if he keeps his interest and progresses with his proficiency, he'll be one heck of a shooter when he reaches young adulthood. After the match I shook his hand and told him it was a pleasure to shoot with him. 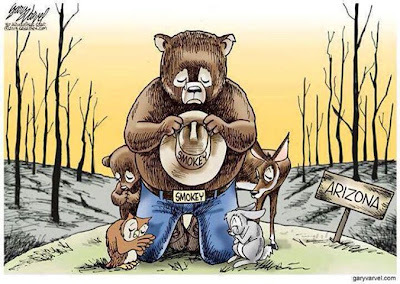 Young folks are the hope of the shooting sports and we need to do everything we can do to help them along. For myself, if I'm shooting I'm having fun. And I had great fun this morning. I don't know my scores, and frankly, I don't care. I didn't show up this morning for scores. I don't believe that any human skill erodes as quickly as proficiency with a handgun and this morning I got to stretch my abilities. I surprised myself with some very good shots, and I surprised myself with some very poor shots. I'll be back next month. After I load a bunch of .45 ammo. I was piddling on my bench today and decided to section a bullet. 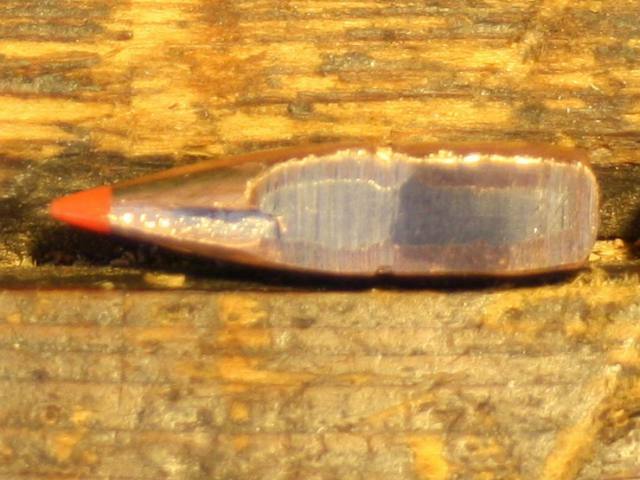 A common .30 caliber 150 grain Hornady SST, #30302. This bullet is marked as an Interlock bullet and I wanted to see if I could find the Interlock. Just about the time I finished sectioning the bullet, my son came into the shop and we looked at the bullet with a jeweler's loup. He tells me that he can see the interlock, but my tired old eyes can't make it out, even at 10 power. So, I decided to take out the camera and see if I could get a picture. My camera skills ain't great. I can plainly see where the cannelure ring locks the jacket to the core, but I can't make out that Interlock ring. Maybe when I get some quiet time next week, I'll polish that surface and see if I can't get a real good picture. These are great, excellent bullets and they fly nicely, but I'm darned if I can make out that ring. It's been a rainy Thursday, and since I couldn't get out to do any work, I didn't. I dragged the pit under the drip line and I lit the fire. I've got a whole chicken in there, and potatoes on the stove for 'tater salad. In another few minutes I'll put some sausage on to whet the appetite. As I type this, the thunder is still rolling, with pop up showers all around us. I simply rub the chicken with a good rub, then light a medium fire with lots of smoke. You can't see the smoke, but it's wafting out of the seams in the pit. That chicken will be done in another hour. Sometime during the middle of the afternoon, the UPS guy stopped by with a package. The holster for Milady's revolver has arrived. I ordered it from El Paso Saddlery, and it's a beautiful piece of leather. 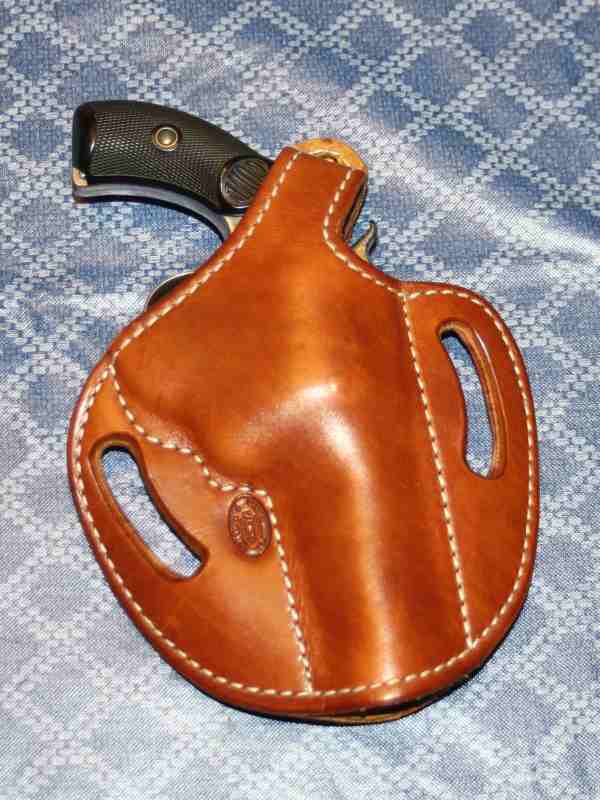 I figured that a holster maker who's been crafting leather since 1889 should have a pattern for a holster to fit a Colt Pocket Positive and I was right. That's some good looking leather, with a nice fit. Just what you'd expect from a custom holster, and I'm sure that it will serve her well. Isn't that a beauty? Milady likes it, it fits the little revolver, and now if Milady chooses to go strapped, she's got a snazzy piece of leather to show off. She'll probably never go heeled, but she might decide to wear it to a barbeque. That would cause a twitter amongst the ladies, wouldn't it? If y'all will forgive me, I've got to put on some sausage. I was poking around on the bench today and found a box on a shelf that I had forgotten about. 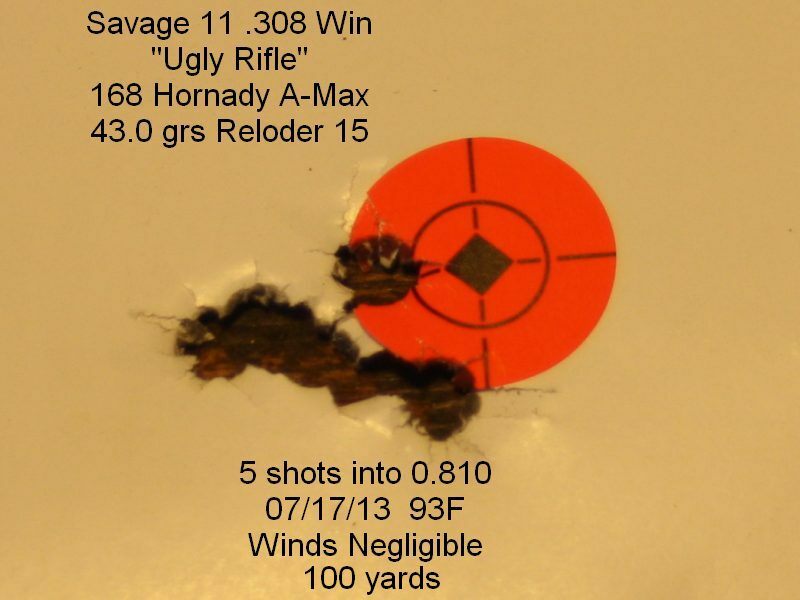 IN 2011 I had purchased a box of Hornady's wonderful .30 caliber, 168 grain A-Max bullets. I played with them for a while, then forgot about them. Sure enough that box still had about 20 bullets left, so I started poking in some other bench drawers, and found 20 Winchester cases, prepped and ready, in .308. 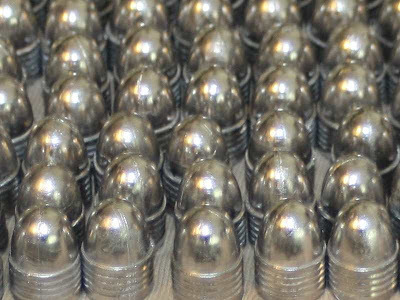 I got down the scale and in under an hour I had loaded those A-Max bullets into those .308 cases with 43.0 grains of Reloder 15 and a Winchester primer to give it some push. Those of you who follow my scribblings might recall that when I started playing with the Ugly Rifle in 2011, it showed a preference for that load. Since then I've been playing with 150 grainn bullets and while that rifle shoots them okay, it never really shined with 150 grain bullets, being a 1.5-2.0 inch rifle with the lighter bullet. There's nothing wrong with a 2 MOA rifle in a hunter's hands. If you can keep your shots within that 2-minute arc, you'll bring home all the venison you can use. A good 2 minute rifle is eminently usable out past the range where most of us should be shooting at game animals, anyway. However, many of us like to take that variable out of the equation, and shoot for something under one inch at a hundred yards. I get it, I really do.The more variables we can pull out of the equation, the more accurate we're going to be. Knowing that the rifle has professed a liking for that load, I took my handful of ammo to the range to see if what happened then can happen again. I also took a few of some other loads to try. I got to the range, signed in, and went out to the firing line. I got settled in behind the bench and started shooting, slowly and methodically. A variety of 150 grain loads, all hovering around the 2 inch mark. I'd shoot a group, then go talk with the range master while the barrel cooled. The temp out there was above the 90F mark and while I was waiting, I could see little clouds popping up in the evaporation over the Red River. Some of those little pop up clouds may make thunderstorms later this afternoon. I sampled a few of the 168 A-Max loads and they were tantalizing. Sometimes two shots would touch and the third one would fly off a half-inch or so. Still, it had promise. Toward the end of the second hour, I posted a new target, and decided to take my time and shoot with all the patience I could muster. That thin sporter barrel had gotten fairly warm, so I got a bottle of water and went to the rangemaster's shack to cool off. After ten minutes of telling lies to my old friend, I walked out to the rifle laying on the bench, settled in, chambered a round, and let fly. Checked my watch, waited three minutes, and let fly. Continued in this vein until five shots had fallen on the target. Looked through my spotting scope and decided to walk down range for a closer look. That's a one-inch target dot, and all five had fallen into 0.810. Not bad for an old man with a pawn-shop rifle. I think two clicks up, two clicks right, and I'll be through sighting this rifle for the season. Now, it's time to see if I can find some more of those bullets and get away from the bench. It's almost time to tune up for deer season. This year, the Ugly Rifle is going with me to the deer woods. I know that Hornady makes this bullet in a hunting version. Come next payday I'll have to see if I can get several hundred of their 168 SST bullets. I was at the LEO qualification range early this morning. I took that J-frame I had trouble with last week and got by myself on an unused range. I took some time to look at targets, do a little tune-up on my technique, and practice a little bit withe the little pistol. 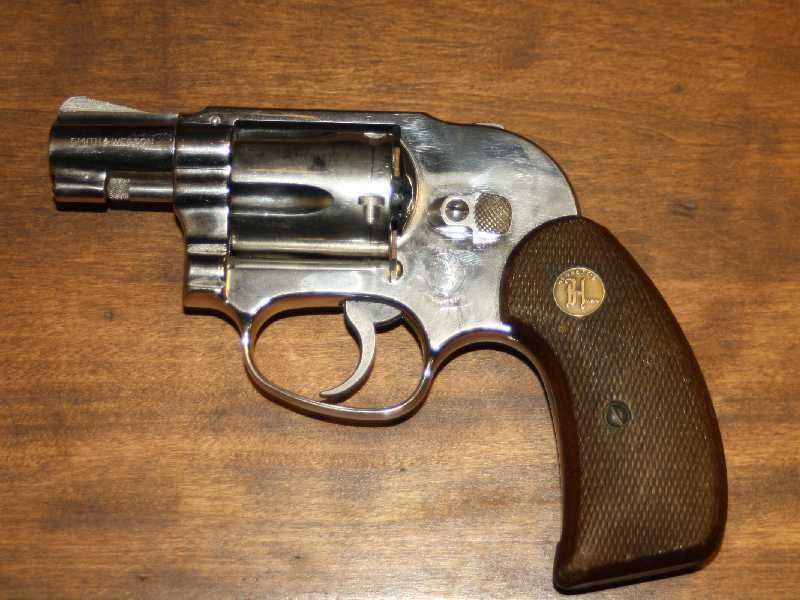 It's a Model 38 Airweight, an iconic revolver. Mine is nickeled and I've only had this particular revolver for 18 months, but it's one I looked for, for years. I could here my brethren on the firing line, going through their annual quals. 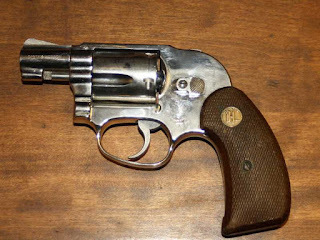 In just a few cylinders, I figured that I had learned what I needed to learn about this little revolver and that I was ready to take it down-range. I walked over to the qualification line and got a target ready. Talked to my Captain a few minutes, and before too many minutes, they were calling for the next order. They had room on that order, so I went out and posted a target and fell into the well-known routine. Ten cylinders later, I was done. The Louisiana POST course is 60 rounds, based on the revolvers that we all carried in the '80s and early '90s. It's ten cyinders. If you're qualifying with a five-shot, it's still ten cylinders, for 50 rounds. Max possible score with a five-shot is 100 points, with 80 points or better to qualify. We shoot it on the standard Louisiana P1 target. The cousse doesn't give you any freebies on distance. You still have to start at the 25 yard line and work closer, to the 2 yard line. When the shooting was over, we began policing brass while the instructors scored the targets. One young'un asked me what I was shooting. When I told him he looked askance at the little revolver, then back at me, wide-eyes. "Really?" "Yeah, really.". About that time, the trainer got to my target to score it. He turned and holler at me. "You shooting a five-shot?" "Yep", I replied. When he had marked the target, he wrote a big 90 on the face of the target. When I looked at the target, I had to agree, I had dropped a few outside the scoring ring, probably from the 25 yard line. Still, the rest of them were in the scoring ring. I'm qualified with the Airweight, and that's done for another year. Many of us buy a rifle and mount a scope on it, only to find that the comb of the rifle is too low to properly look through the scope. We need a cheek riser. Proper cheek weld is important to your marksmanship and there's nothing quite as aggravating as having to move your head around to see through the scope. 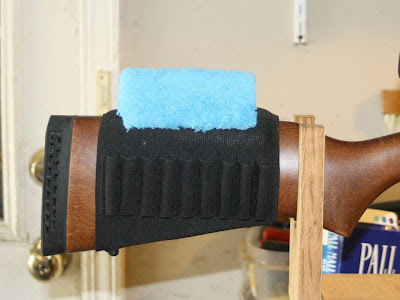 There are several ways of curing this problem, and you can find stocks that have adjustable combs, you can buy add-on cheek risers, or you can make your own. Being the frugal sort of guy that I am, I looked around at locally available items that might suffice. The first thing I found was an elastic buttstock ammo holder. These things normally hold nine rounds of rifle ammo and can be found in any of the big box stores, normally for under $5.00. All by themselves, they're a worthy addition to any hunting rifle, and I normally pick up a couple a year. Someone is always needing one, and I try to keep several extras on hand. That's half of the answer to a cheek riser. Because the ammo holder is elastic, you can put something under it to raise the comb of the rifle. I like to use common pipe insulation, although even a child's swim noodle would suffice. In the photo below, I've cut up a piece of old swim noodle to demonstrate. That baby-blue thing is a piece of a kid's swim noodle. I prefer pipe insulation that I get at the hardware store because it seems to be more durable, and one piece of insulation could be used to make a dozen cheek risers. Simply insert it between the stock and the elastic ammo holder. It may take several tries to get the right height, but this is the best way I've found to inexpensively raise the comb of a rifle. **UPDATE** I posted my handyman fix on a forum, and a commenter led me to the Beartooth Comb Raising Kit. At $22.95, this looks like a good, inexpensive fix. It's remarkably similar to my cobbled-together cheek riser. I may have to buy one to try. 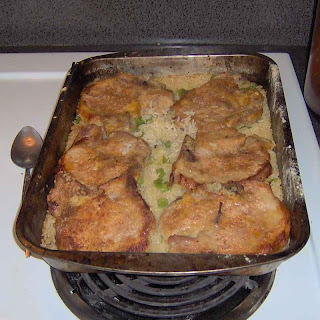 Momma's coming over for lunch, and Milady decided to cook pork chops and rice. With, of course, purple hull peas, cornbread, and iced tea. Sunday dinner at PawPaw's House. I can smell it all cooking in the kitchen, and my salivary glands are working just fine. The dog finally got a trim this week, and with the heat index over 100F, I think that he's considerably more comfortable. Here's the picture from last week. And, here's the one from late yesterday afternoon. Yeah, I'd say that's a little better. He still likes the shade and I don't blame him. If he starts getting into my whiskey, I'm going to raise hell. So, I 'm reading Insty, and I get waylaid by some feminist talking about antipasta. Now, I've taken English at graduate levels. I know that anti means against, and pasta mean flour based boiled bread. Like spaghetti, macaroni, fettucini. That sort of thing. You've eaten a lot of pasta. We all have. So, whathehell is antipasta? It ought to be something that is anti-pasta (although for the life of me, I can't imagine anyone who is against pasta). Turns out, it's toast, with pepperoni. Maybe some garlic, and olive oil. I've got nothing against olive oil, but it's over-rated. Give me a good peanut oil every time. Or simple canola. They sell it by the gallon down at the Safeway. I can't imagine frying catfish in olive oil, but any good vegetable oil should suffice. Hang on, I've got to make another drink. I've been drinking red whiskey for an hour. What were we talking about? Antipasta, which isn't pasta at all. It's toast. With pepperoni. She's going to put that out for her boyfriend's parents. Good move if you never want them to visit again. Put out some meat pies, with brown gravy, and mashed potatoes. Maybe a little Maque Choux, that'll impress the in-laws. If any of my daughters-in-law serve me pepperoni on toast, I'll be pleasant, but when I leave I'll stop at Taco Bell and get something to eat. Antipasta. It's Yankee for "I don't know how to cook." we'd do a good amount of syrup, mash in some butter, and dip cold left-over biscuits in it for an afternoon snack. That was sopping. 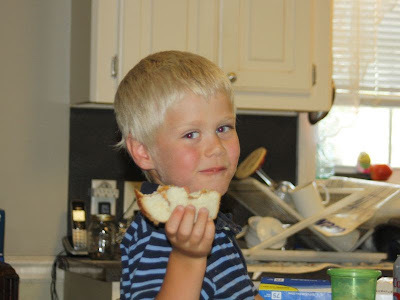 Using bread to get food to your mouth. You could sop anything, the leftover egg yellow, spaghetti sauce, anything that would absorb or stick to bread. Back in those days, a dollar was mentally divided into many different denominations. One of those was a bit, which was an eighth of a dollar. A quarter was two bits. Sitting around the country store, you might be talking about a rich man, and someone would say "He don't care if syrup goes to six bits a sop." That was a rich man who'd pay seventy-five cents to sop a biscuit. Back in those days a quart of syrup probably didn't cost more than a dollar. Any fellow that could pay six bits for a sop didn't worry about the cost of syrup. Milady and I went to the auction last night. She was pressed into service as the clerk, as the normal clerk is on vacation. We did well. They were selling .22LR ammo and the bidding quickly went way beyond what I thought was reasonable, even in these shortage times, so I let them walk. Next up was a couple of boxes of centerfire pistol ammo and I threw my paddle in the air. Got them both at pre-shortage prices. Not a bad deal for good, clean, reloadable factory ammo. A few items later, and the block held a trombone. We have a grandson that plays trombone seriously. He'll probably go to college on a music scholarship. He's already been offered a couple of scholarships and he's not yet in his senior year. So, when Milady saw the instrument, she decided to bid on it. If nothing else, it will make a good "extra" trombone in the event he needs another. I admit, I know nothing about trombones, and we didn't have time to research this particular model, but Milady won it at an extremely attractive price. Really, extremely attractive price. I figured that the case was worth more than she paid for the whole lot. When we got home, I researched it. It's a Holston TR602, a student trombone, but evidently one of the better student trombones. Granted, it's used, but it isn't rough. And for the price Milady paid, she got one heck of a screaming deal. 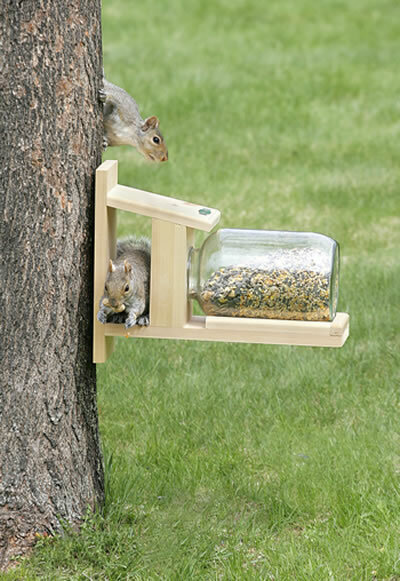 Brother-in-law wanted a squirrel feeder, and sure enough, we found a squirrel feeder to bid on. And won it. So, last night we bought handgun ammo, a squirrel feeder, and a trombone. There's no telling what you're going to find at a good auction. Tiger Butter. That's peanut butter with just enough cane syrup mixed in to jack the sweetness up to diabetic coma levels. It's a great grandkid pleaser. Ultra sweet peanut butter on fresh white bread. It's a great late-afternoon snack. I'll take him to his dad in another half-hour. Dianne, if you're reading this, get Trey's kids jacked up on Tiger Butter, then take them home. Their parents will thank you later. Friday is a laid-back day at PawPaw's House. After coffee I mowed the back yard, a chore that takes about a half-hour to accomplish. Not much of a task, but that was on my work list today. Milady is making meat pies, assisted ably by a grandson who insists on helping. These pies will be frozen for frying later. We've got a big gathering planned for July 27th. Milady's clan will be here that day to celebrate their mother's birthday. Meat pies are on the menu and Milady will have several batches by then, all frozen, and I'll fry them that morning. Easy Peasy. 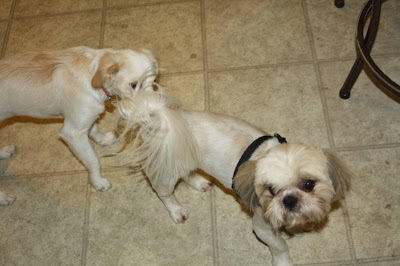 The dog is at the groomer's. Quiet around here without him under foot. He'll be properly trimmed for the Sunday Dawg. We'll be at the auction later this afternoon. Milady is clerking tonight, so I'll be there until the closing gavel. The doors open at 5:00 and bidding starts at 6:30. Not a bad way to spend a Friday evening. PawPaw's got an old Sears riding mower with a 42" deck. I've had this mower since the spring of 2004, and it's a good lawnmower. Change the oil once a year, put belts on when necessary, use non-ethanol gasoline, and it starts every time. I think it has the original spark plug. I don't recall changing it. It's on its third battery. This has been a great lawnmower for my little acre. Normally, it takes me about two hours to cut the grass. Not today. I crawled on the lawnmower at 7:00 and just got off. We had mechanical problems. I had just begun cutting the front yard when I smelled rubber and the blades quit turning. Well, hell, but that belt is three years old. So, I went up the road to the small-engine place and got a belt. Came home, put it on, no problem. Started mowing again. Smelled rubber. Before I could shut it down, the belt broke. Just Dammit. Rode the mower into the garage, started removing the deck. Of course, those little pins were rusted in place, hard to get out. Finally got all the pins loose and the blade engagement spring removed. Slid out the deck. Started looking, found that something called the brake arm spring braket had rusted through, turned loose, then the spring ran int to the new belt. Cussed like shipwrecked sailor. Threw the parts in the truck and headed back toward the small engine shop. Bought another belt, talked to the tech guru on lawnmower decks. Listened carefully. Went home, greased everything while it was out, commenced installing the deck. Got it all installed, double-checked everything. Checked it again, just for giggles. Got on lawnmower, commenced mowing. Looked back, only one blade cutting grass. What The Hell? Went back into garage, jacked up lawnmower. Blades loose. Little bolt, not even finger tight. What the Hell? Cussed some more. Took off blades, cleaned all mounts. Re-installed blades. Started mowing grass. Looked back at cut. What the Hell? Scalping grass down to dirt. Mower set too low, all the way down. Must have bumped the deck height adjustment. Re-adjusted deck. Finally finished mowing grass. This mower is on it's 10th season. It might be time to start thinking about a new lawn mower. Or spend some bucks reconditioning the deck on this one. It's been a good lawnmower, but I can't do this every week. I'm still playing with my Archive page. I decided to add a category for recipes, and I put up two favorites. I also put up an old article I did in 2008, talking about the .30-06 and my experiences with it. The Archive page is here. Today we showed up at the training classroom for a day of fun, frolic, and classroom activities. We talked about upcoming training requirements, what to expect next year. It seems that the POST council is getting a larger online presence and much of the training, as in all other fields, will be online. 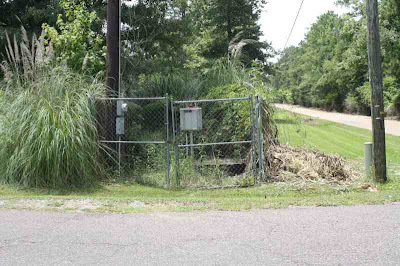 Even instructor-driven courses will have an online presence and by 2015 each law enforcement officer in Louisiana will have to maintain an online account with POST. That ought to be interesting. We also talked about defensive driving, as most of the traffic accidents logged by police officers occur during normal driving activities. It's not pursuit driving, but normal patrol activities that destroy automobiles. We talked about trends in law enforcement, particularly threats that are evolving, and we talked about how to spot those threats. Then lunch. During the lunch hour, I walked down to the rifle range and put a few shots through the Ugly Rifle. Just a few, to verify zero. After being in air conditioning all day, it was nice to get out in the sun. However, before that hour was over, it had gotten darn hot, so I went into the range shack and bullshitted with the guy that runs the rifle line. After lunch was Taser re-certification. About an hour-and-a-half, and we were done. PawPaw is now duly recertified for another year of active law enforcement. We got to the range this morning, and promptly began our annual qualifications, using the Louisiana POST course. PawPaw qualified easily with his service pistol, then after the targets were scored and recorded, the range master asked if anyone wanted to shoot with other handguns. I qualified in the second order with my Kimber 1911, several points higher than I qualified with the service pistol. In the third firing order I was out on the line with my J-frame, and I dropped enough points with the snub nose that I didn't qualify. After that order, we cleaned the range and broke for lunch. The firearms instructor asked if anyone wanted to qualify with patrol rifles, and of course I posted a target and headed to the line. I qualified easily with the AR, and early in the afternoon we were released for the day. I need to figure out what I'm doing wrong with the J-frame. A little practice and the qualification should come easily, but I haven't shot the Airweight as much as I have the other pistols. For those interested, the Louisiana POST handgun course is online here. For the record, it was hot out there today. I'm soaked in sweat to my skivvies, and shortly I intend to remedy that situation. Every year, every cop in the US is required to go through a retrainer, normally three days of re-training, to bring us up to speed on the latest techniques, make sure that we're still competent, and to make sure that we have the basic qualifications to do the job. Today was Weapons Retention. A very good subject for a street cop, and an especially good subject for a school-house cop. The instruction was very good and we got plenty of opportunity to practice techniques. It was good training. Now I'm a little bit sore, and a little bit tired. I'm also bleeding a little bit, but that's not the fault of the instructor. PawPaw is on blood thinners and any little scratch tends to bleed all out of proportion to its size. I got a little bitty cut on my wrist from being scraped with a front sight post, and you'd have thought that my sparring partner had gotten into a major artery. Blood everywhere. PawPaw's okay, but I've got a bid ole bandage on my wrist. Tomorrow, firearms qualifications. My favorite part of the retrainer. I'm gathering off-duty and backup guns. I intend to qualify with as many as they'll let me shoot tomorrow. I'll make sure I have plenty of water for hydration, and plenty of band-aids in the vehicle. 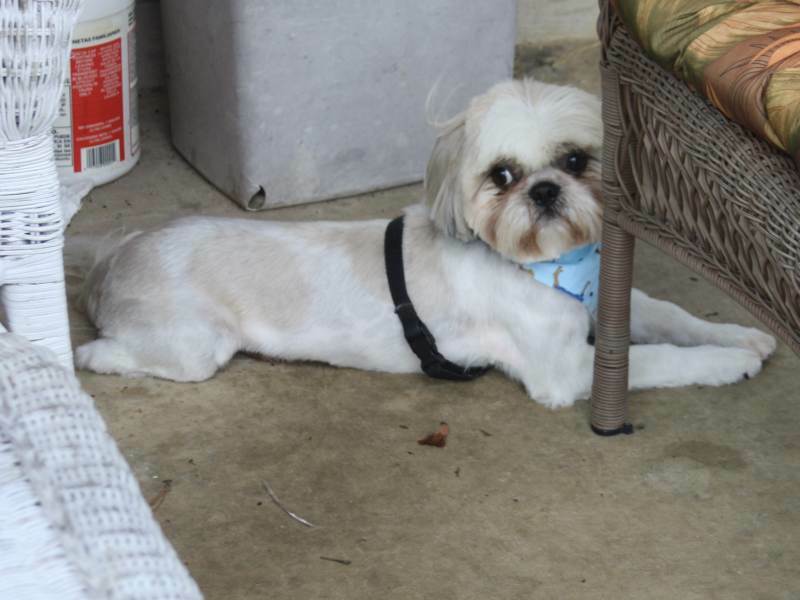 With moderate temps this week, the dog has spent most of the week on the back patio. Yesterday we hosted the bi-weekly family gathering, so on Saturday morning, I got up, moved all the patio furniture, swept and hosed off the concrete. Our biweekly gathering moves from one house to another. Every two weeks someone hosts it, and you never really know if they'll all be there, especially this time of year with vacations and short weekend trips. Still we carry gamely on. Generally, two dozen people show up, from four generations. It's quite the gathering, and we all look forward to it. The hosting house cooks the entree and the visiting houses bring the side dishes. 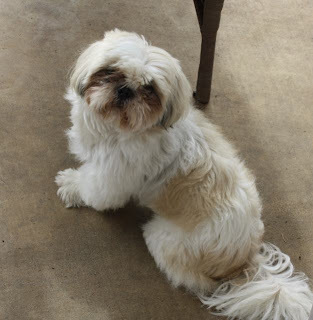 Still, the dog is enjoying the patio, and no, he didn't get a haircut this week. The holiday got in the way of the planning. Maybe this week. He's wondering if there are any leftovers from last night. No luck, pup. They ate it all. Recently, I ordered two Safariland 6378 ALS holsters from Cops Plus. They came in yesterday. In today's mail came a package from Amazon.com that included some of Safariland's ALS Guards. This ALS Guard is a little device that shields the ALS lever and increases the holster from Level 1 to Level II.. I just installed them and I'm going through the familiarization on them, with both my SW M&P and my 1911. So far, so good. I'll review them at a later date, but once I get the hang of these little devices I believe I'll like them a lot. Anytime you can increase the retention level of your holster, and you can do it intelligently, that's a good thing. The one thing to watch for is that you don't make the pistol too hard to get out of the holster. A pistol that's stuck in it's holster is almost worthless. Still, these devices seem to be very well made, ergonomic, with good affordance. With the ALS Guard in place, the holsters work a lot like the Model 6360 that I carry on my duty belt, with the same muscle memory for releasing the firearm. That a good thing as I don't have to learn another system. In other news, I've got a brisket cooking for the family's bi-weekly gathering tonite. The patio has been swept, folks are calling asking what they can bring, and all that's left to do is to clear the refuse off the dining room table so that we can entertain. It's just about time for a nap. Y'all have a great Saturday, and I'll catch up with you tomorrow. An interesting article at Slate about taking your leave from a gathering, focusing on the terms we use to depart from that gathering. Ghosting—aka the Irish goodbye, the French exit, and any number of other vaguely ethnophobic terms—refers to leaving a social gathering without saying your farewells. One moment you’re at the bar, or the house party, or the Sunday morning wedding brunch. The next moment you’re gone. In the manner of a ghost. “Where’d he go?” your friends might wonder. But—and this is key—they probably won’t even notice that you’ve left. Pull Pitch. When a helicopter pilot is doing his thing and decides to depart, he pulls on the collective, increasing the pitch of the blades, lifting the helicopter from the ground. He departs. Usage: "Where's Danny? I think he pulled pitch." Wheels Up. Another aviation term. Early in every flight, after departing the runway, the wheels become extraneous. In retractable aircraft, the astute pilot will raise the wheels to decrease drag. Usage: "Where's Julia? I believe she went wheels-up." Saddle Up. Equestrian reference, when one wishes to depart an area, it's wise to put a saddle on the horse. Usage: "Where's Lisa? She saddled-up about twenty minutes ago." Beamed Up: A classic Star-Trek reference: Usage: "Where's Tom? He had to beam-up.". These are four references that came to me in seconds. I'm sure my vast readership has others. It seems that Pope Francis has issued his first encyclical. ROME, July 5, 2013 (LifeSiteNews.com) – In his first encyclical letter, released this morning, Pope Francis has reiterated that marriage is a union of one man and one woman for the procreation and nurturing of children. Well, of course. I would not have expected otherwise. Which rifle will be your "go-to" this year? Probably the Ugly Rifle. I haven't made meat with it yet, and I'd like to do that before one of the grandkids absconds with it. Enjoy. 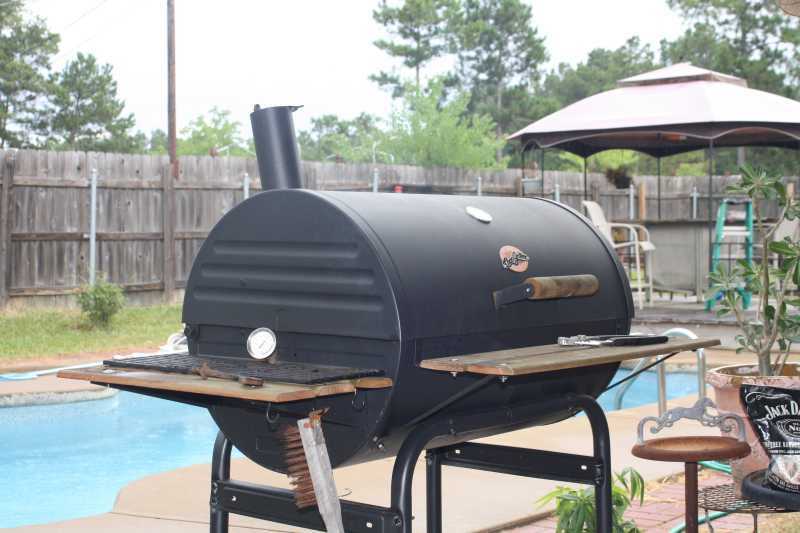 It's about time for me to fire up the pit. 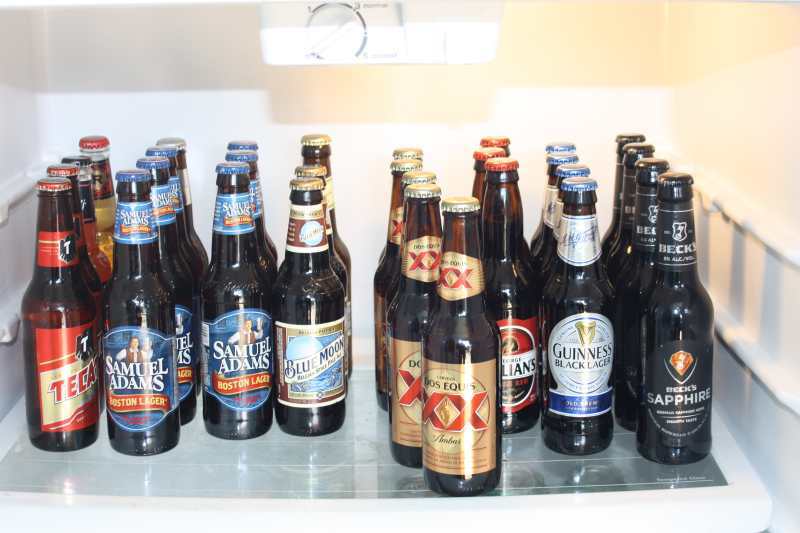 I don't drink much beer, but when I do, I like variety. So, every three or four months, I'll go down to the local package store to see what's in the back room. The proprietor has broken six-packs that he can't sell, and he makes me a good deal on a case of mixed beer. It clears out his stockroom, it gives me an opportunity to sample something new, and it comes at a very attractive price. Let's see what we have there. We've got some Tecate, some Sam Adams, some Blue Moon, and some Dos Equis. There's Killians, there's Guiness Black Lager, and there's Beck's Sapphire. I even think that there's one Hard Lemonade, one Red's Apple Ale, and one misplaced Coors Light back there. The family is coming over on Saturday for our bi-weekly gathering. That should suffice for the beer palates. On this day in 1863, General Robert E Lee gathered his army and moved south. His invasion of Pennsylvania had come to its frightful conclusion and Lee decided to move south, to cross back into Virginia, where he'd stay for most of the next, bloody year. Several hundred miles away, on the bank of the Mississippi, Confederate General Pemberton surrendered his Vicksburg garrison to Ulysses Grant after a long siege. The Mississippi river was once again in Union hands. Before long, Grant would be recalled to Washington and Grant would release his arsonist to begin the march toward Atlanta. It's odd how important, historic things seem to congregate on specific days, whether through planning or happenstance. Still, this is the birthday of our nation, and all Americans everywhere should celebrate another year. This is a resilient nation and even in the midst of anguish and agony we find time to celebrate her birthday. I've been working on a big post on Holster Retention Levels. It's really too big for this format, but you can read the whole thing over on my website. I've been playing with HTML since it got too hot to work outside. I used to be fairly good at coding web pates, but I've been trying to make columns, using the DIVcommand, and I'm having a bit of a problem with justification. I'm trying to make an archive page for some of my writings, and I just can't seem to make it do what I want it to do. Let's just say that my brain is fried. Coding has always been hard for me, and I don't enjoy it a bit. Which is why I use blogger instead of some of the other blog engines. I mailed a money order today for my membership on the deer lease. I've been a member of this lease for about six years, and it's a great club. Local boys, salt of the earth, they're all local folks and at 40 miles, I've probably got the farthest to drive of any other member. Except maybe Bobby, who grew up near the lease and drives down almost every weekend. He's got a house nearby that he keeps for a place to sleep when he's in town for the weekend. Still, my membership is paid for another year, and I'm gettinng ready for deer season. We've only got about ninety days to get ready. 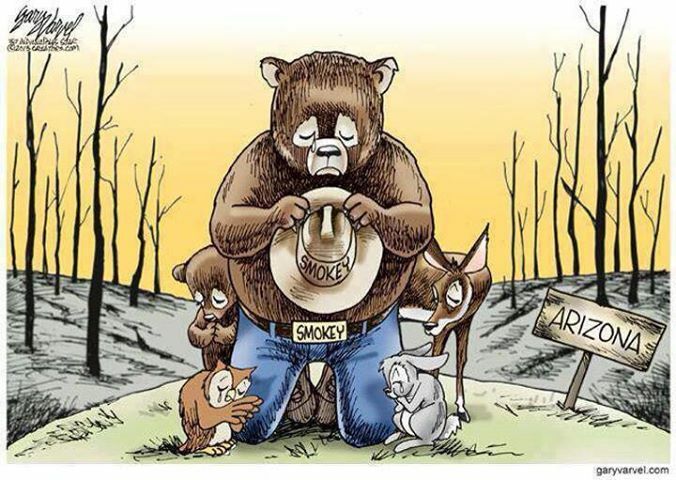 In memory of the Hotshot crew from Prescott, AZ. Good job, guys, rest in peace. Hat tip to the Holgate Volunteer Fire Department for the artwork. A snowcone is an easy treat on a summer afternoon. Nothing but shaved ice and flavoring, the snowcone stand is ubiquitous around the South. Today after lunch, the boy-o and I decided to trek to a snowcone stand for a tasty treat. His favorite flavor? Watermelon, while PawPaw opted for the Blue Bubbegum. Milady, as always chose a local favorite, Tiger's Blood, which has cinnamon overtones. 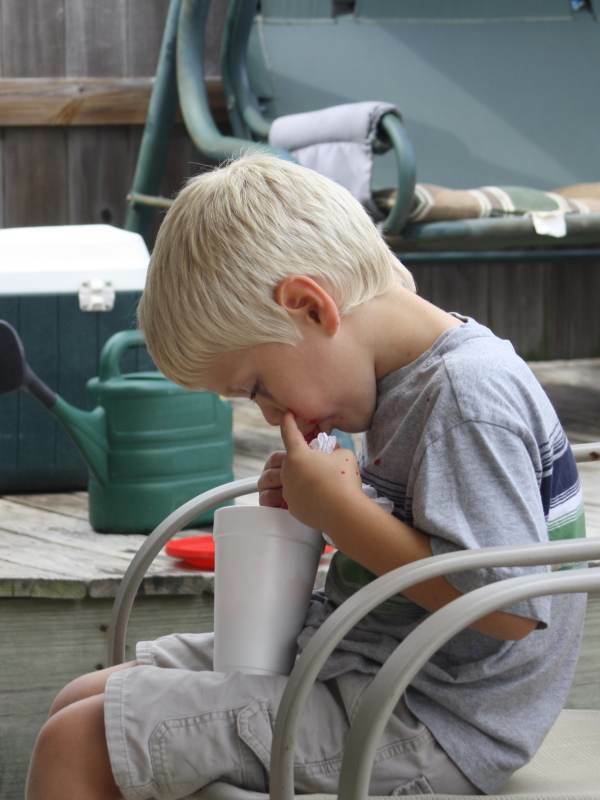 With temps in the low nineties, a snowcone is a welcome relief. Of course, brain-freeze is a constant threat.